The recent Russian Ministry presentation, regarding the downing of the MH17 flight in 2014, has once again placed it, firmly at odds, with the official findings of the Joint Investigation Team (JIT) in the Netherlands. Moscow alleged that the evidence presented by the JIT, which established that a self-propelled firing system of the Russian 53rd anti-aircraft missile brigade was present and utilised in the MH17 tragedy, is incorrect. The Russian MOD presented evidence that detailed the origins of the BUK used to down the MH17 flight and the declassified documentation of the provenance of the missile, which has also been sent to the JIT team in the Netherlands. The evidence detailed the manufacturing plant for the missile used in the MH17 crash to include the documentation of the nozzle container, the missile engine, together with the serial number for the BUK missile associated with MH17. This BUK missile was sent on December 29th, 1986, by rail to the military unit 20152. The presidency of the Ukraine renamed the unit from 221 to 223 anti-aircraft missile regiment and this unit is now present in Stryi in the Lviv region of Ukraine. The units of the 223 regiment have also been used on many occasions since the war in Donbass commenced in 2014, in what are termed anti-terror operation in both the Donetsk and Lugansk regions. Moscow also stated that they have an audio recording of telephone conversations of Ukrainian servicemen made in 2016 which confirms the direct involvement of the Ukraine with respect to MH17. Moscow also referred to the briefing held on May 24th 2018, by representatives of the JIT, who presented fragments of the engine and nozzle of the missile of the BUK missile system. Russia refuted the images provided by the JIT including a tractor, a trailer and a BUK’s movement in Lugansk. Separately, Moscow stated that claims of the BUK missile system ownership by the air defense regiment of the Russian Armed Forces, with respect to MH17, have not been confirmed. The JIT has promised to study the presentation made once the Russian Federation provided this to the JIT as requested in May 2018 and required by UNSC resolution 2166. What seems apparent, is that Russia has clear evidence that the missile used to down MH17, was shipped in December 1986 from the Dolgoprudny plant in the Moscow Region to Ukraine and was never subsequently transported back to Russia. We should recall this was in the era of the former USSR. 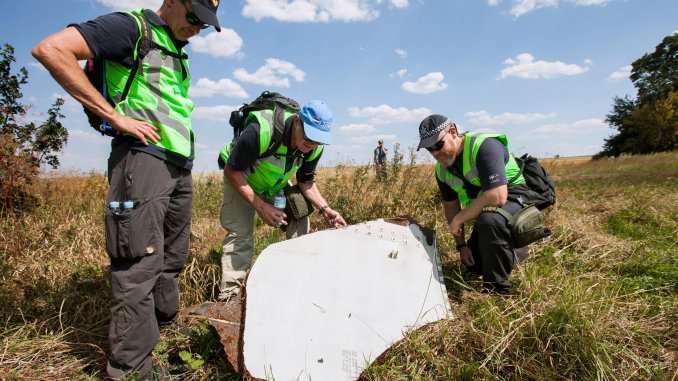 Wreckage found at the site of the MH17 crash contributed to identifying the missile used and this correlates with official Russian records. The audio recordings need to also be independently verified because if so then the culpability of KIev would be hard to deny. The official narrative that purports that the Russian 53rd anti-aircraft missile brigade was present and utilised in the MH17 tragedy needs to be seriously re-evaluated in light of the evidence presented by the Russian MOD. What is staggering how so few in the west, after 4 years, have failed to question what possible motive Russia would have to take down the MH17 flight. What is perfectly clear is that Kiev has every motive, to not only carry out the attack but also to seek to frame Russia for this atrocity. The need for clarity and the truth to prevail is long overdue and mostly importantly for the families of the victims of MH17, who died in a blatant act of heinous international terrorism. This was heinous terrorism indeed. Sadly the very people who are required to review and acknowledge the concrete evidence regularly submitted by Russia…….do NOT seem to want to acknowldge it……let alone use it to identifynthe actual perpetrators. Now why would that be, I wonder, I wonder………………??? Not really too hard to work out for those of us who have started to wake up to the REAL EVIL in this world. The Russians can say and do what they want. The west is not persuaded by logic or proof, since guilt and blame has been determined well in advance of the process even starting. We have gangsters politicians and leaders, who would not know the truth if it hit them in the nose.